My best advice for those considering investing in marijuana stocks…Buyer Beware! YTD value of shares traded in the sector leader, Canopy Growth Corp (‘CGC’), has topped $2.6b making it the most traded security in its respective sector; by comparison, it would put it in the top 5 securities traded in the tech sector and top 20 securities traded in both the mining and energy sectors. Another larger player in the industry, Aurora Cannabis (‘ACB’) has seen $500m worth of stock trade hands over a two-month period. Using a run rate of $250m per month, it is possible that $3b worth of shares will trade hands over the coming 12 months, likely making it one of the most traded securities by value on the TSX. While I believe it’s hard to take into consideration valuation ratios considering that the marijuana sector is in it’s infancy, it does shed light on just how overvalued the industry is. Both CGC and Aphria Inc, the two largest players in the sector, trade at 47 times revenues for the prior 12-month period. Using this measure would make both companies two of the most over valued on the TSX. The entire sector is valued at approximately $3.1b while total revenues are only $24m, that’s a sector price to revenue ratio of 125! We’re seeing a trend where publicly traded corporations operating in the mining and resource sectors shift focus towards medical marijuana, a business for which management has little to no understanding of. Take Supreme Pharmaceuticals (formerly Supreme Resources), a failing resource explorer which saw its share price jump from $0.25 to a high of $2.50 as a result of its change in business focus to medical marijuana. Affinor Resources followed the same game plan shifting focus towards medical marijuana and watched its share price jump from $0.02 to a high of $0.18. For the companies that are licensed under health Canada to cultivate/distribute medical marijuana, valuations are already sky high, but for these companies jumping on the bandwagon, most of them not even licensed, are watching their valuations hit the stratosphere on news of pending applications with Health Canada, which frankly isn’t even news. It’s worth noting that since 2013 Health Canada has received 1561 applications to cultivate or sell medical marijuana and have issued only 37 licenses, for those that are counting, that amounts to a 2.3% approval rate. Suffice to say, corporate disclosures of ‘Seeking Health Canada Licensing…’ shouldn’t carry much weight. While many will argue that medical marijuana securities are accurately pricing the prospect of the legalization for recreational use, there are still many hoops to jump through that could delay or worse, cancel plans for recreational legislation thus sending valuations sharply lower. To name a few: The current Liberal Government has shown an astounding ability to back peddle on earlier commitments made and could do the same for recreational usage of marijuana. Despite a recent Federal report giving the thumbs up on recreational usage, there are still some very big gaps to fill, for instance, how will law enforcement test for THC levels and what THC levels will be considered too high to operate a vehicle. Despite the Canadian Medical Association’s praise of the federal report, it has warned to ‘…Proceed very carefully…’ with respect to recreational legalization. Finally, while the Federal report has outlined high level guidance for recreational marijuana, actual legislation may fill the gaps by being overly conservative thus adding costs to both cultivators and distributors and leading to lower margins/valuations. From the Tulip Trade in the 1600’s, all the way through to the Dot-Com mania in the late 90’s, asset bubbles have more or less followed the same pattern. For a bubble to form there must be some sort of catalyst that sets the stage, that can be anything from a change in economic policy, a significant reduction in supply, a technological disruption or in the case of marijuana, a change in legislation. In the beginning stages, very few recognize the profit opportunities and price increases at a steady pace, at this stage, it’s mostly early investors whom are participating in the market. As the asset gains recognition, the bubble continues to grow, as outsiders looking in attempt to legitimize the asset’s current price level giving a false sense of security to existing investors whom continue holding on to the asset. “Experts” in the particular asset are now coming out from the woodwork proclaiming the asset’s utility has been underestimated all this time. This adds to the false sense of security to existing investors and may cause them to double down. Doubters quickly turn into believers and quickly jump on the bandwagon so as to not miss out on asset gains. The asset price starts on an exponential ascent as demand largely outstrips supply of the asset. Early investors now consider offloading their position which contributes to a slow down in the asset’s price appreciation and may even lead to consolidation. New investors hold on to their respective investments in hopes that the asset will continue on its ascent. Existing investors begin to revaluate their holdings as what was believed to be an accelerated path to riches has been anything but. The market sentiment quickly turns negative and investors start running for the exists in hopes of leaving unscathed. The asset price falls precipitously. Forecasting bubbles is primarily a game of understanding where the majority of investors sentiment is. 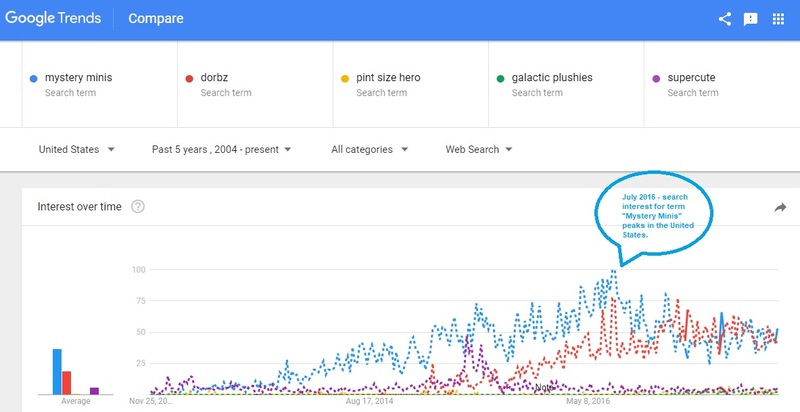 Google trends can give us an understanding of trends with particular keywords and by incorporating a few assumptions we can use the tool as a means of understanding what the general population of market participants would search for prior to making investment decisions in the medical marijuana landscape. They are looking to participate in the bullish run and are unaware of the available stocks to invest in. They will conduct a simple Google search on available medical marijuana stocks followed by an investment in one of the first companies that appears. Market participants know where they will deploy their money, but are looking to gain more information on the company, such as the company stock ticker, etc. Using the above assumptions, we started by reviewing the following keywords search trends isolated for Canadian searches: ‘Marijuana’, ‘Medical Marijuana’, ‘Marijuana Legalization’ and ‘Marijuana Dispensaries’. *The term ‘Marijuana’ was removed from the chart for greater visibility of the other search term trends. It may be a little difficult to discern but the overall search trend (excluding outliers) for all terms were on an uptrend which bodes well for the overall industry. We should note that we’d be concerned if searches for the term ‘marijuana dispensary’ did not show an equal uptrend. We assume that consumers of medical marijuana use the internet as the primary information source in determining where they can source the product. If demand was not as strong as forecasts expect, or even worse, negative, we’d be able to discern this through the trend of ‘marijuana dispensary’. In the context of where we are in the medical marijuana bubble, based on the above we’d assume we’re still in the growth phase. However, when you compare the above search trend data against stock price movements of companies in the marijuana sector, it did not appear that any correlation existed, thus in the context of making a profit, using the above keywords may not be a good approach. *Google search trend data isolated to Canadian searches. Weekly search trend data is posted each Sunday, this was compared to the Monday close of CGC.TO during the periods February – December 2016. We noticed two instances (highlighted in the red boxes labelled ‘1’ and ‘2’) where search interest for the term ‘Marijuana Stocks’ hinted at an upcoming spike in CGC’s share price. It may appear that search data is more positively correlated on the upside than on the downside, but this is not necessarily the case since on 2016-11-16, CGC.TO hit an intraday high of $18 and fell back to $14 which was not captured in the above price data. Suffice to say that while there doesn’t appear to be a 1:1 ratio in the movements of CGC and search trend data for ‘Marijuana Stocks’ we believe the relationship to be more of a confirmation of the overall investment trend. In practical terms, if CGC closes 1% lower on a particular day while search trend data fell disproportionately more, we’d assume that CGC may continue falling further in the days to come. The assumptions above can be applied to the other medical marijuana stocks in the industry (eg: Aphria, Organigram) as their stock price movements are highly correlated with one another. Suffice to say, a comparison of stock price data against search trend volume would be redundant. We should note that in no way are we suggesting that medical marijuana stocks are a cheap buy, they’re undoubtedly overvalued and have all the markings of an asset bubble. However, by establishing that we’re in a bubble and having a general understanding of the asset bubble lifecycle we can use search trend data, to (a) understand which point in the lifecycle we’re in and (b) use them as a confirming indicator of medical marijuana stock price movements. Lagerquist, J 2016, ‘Legalized marijuana plan gets cautious thumbs up from Canadian Medical Association’, CTV News, 13 December, accessed December 30.